What happens when two guys who are serious about grilling find themselves frustrated with the grills and tools they use because they fall short of their expectations every single time? They join forces and try to make the world’s best ceramic cooker, that’s what. Hence, Kamado Joe was born. 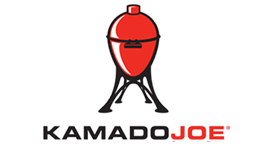 Ever since then, Kamado Joe has been a company known for delivering top quality, innovation, and excellent service. They’ve stayed true to their motto; they’re going to ignite your passion for grilling. This 18″ Kamado Joe Classic is definitely one of the best-looking ceramic cookers in the market today. And its elegant design isn’t even its best feature. 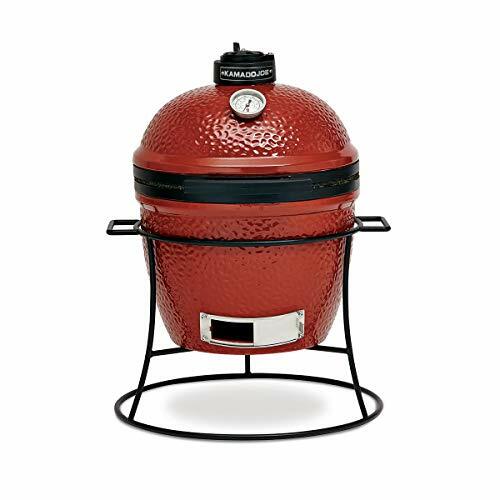 This kamado has a thick-walled, heat-resistant shell that makes holds the heat effectively for even cooking. Their top vent has a dial control that allows for more precise heat control. Like most ceramic Kamado grills, the ClassicJoe does an incredible job at low and slow cooking as well as high temperature grilling. However, there are a couple of things that make it stand out among the rest. While it has a number of similarities with the Big Green Egg, Kamado Joe offers several features that are usually offered as upgrades. With the Divide & Conquer Cooking system, you get a multilevel grate and a split heat deflector that allows you to perform 2-zone cooking – a technique that usually cannot be set-up in round Kamados. Their slide-out ash drawer also is an added innovation that makes cleanup with this particular Kamado a breeze. What it really comes down to is this: the company enables you to truly enjoy the wonder and flexibility of a Kamado grill without asking you to shell out extra money for nifty add-ons. With this Kamado Joe, you get the complete grilling package. There’s no real difference between the features of the Classic Joe and the Big Joe. 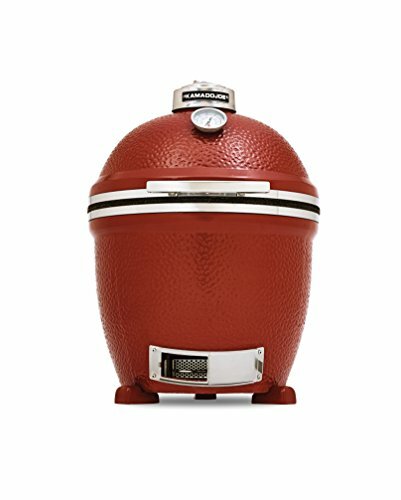 Everything that makes the Classic an amazing Kamado grill can be found in its big brother. You still get the Divide and Conquer Flexible Cooking System, the slide-out ash tray, the dual-disc vent system, the spring loaded lid, the stainless steel cooking grate, the built-in thermometer, the cart with locking wheels, the grill gripper, etc. The only reason you’ll be choosing this one would be for its side which, naturally, increases its flexibility in terms of the amount of food you can cook at a time. With the Big Joe, you can easily fit in three full racks of ribs for you and your very large number of guests. So if you’re looking for a good-sized Kamado grill that comes loaded (well-accesssorized) and is ready for use as it is, then you need to get yourself the Big Joe. Obviously, most Kamado grills aren’t transportable. Made from ceramics, these are really heavy grills that are very fragile. And so, most kamado grill lovers have come to expect that they can never take their kamado grills anywhere. They’ll just have to make do with enjoying the wonders of this amazing grill at home. Well, that’s no longer true today. Kamado Joe has come out with the first ever kamado grill that’s perfect for camping, picnics, and tailgates – the Joe Jr. With this portable kamado grill, you get a grill (of course), a smoker, and an oven that can be ready for cooking in 15 minutes. While this grill doesn’t feature the unique Divide & Conquer Cooking system that the previous two have, it’s still equipped enough to meet your grilling needs and then some. You get even cooking, smoking hot temperatures when you need it, and maintains the temps really well. Plus, at only 68 pounds, there’s no question that moving this grill around won’t be a problem. Also, in case you’re wondering, this kamado grill is solidly constructed with quality materials just like its bigger brothers. If you’re in the market for a smaller grill for your home or one for on the road, you might find that the Joe Junior is the grill you’ve been looking for. 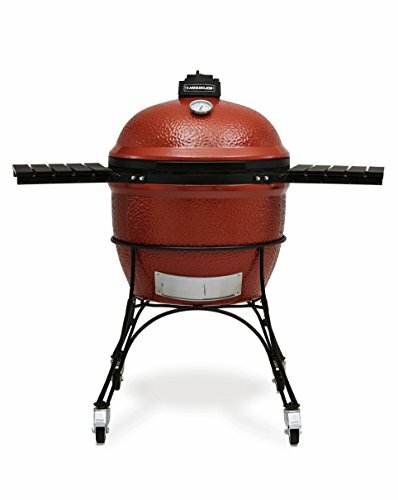 Not sure if you want a gas grill or a kamado grill? Well, here’s an option for you – the Combo Joe 32″. With this grill, you get the best of both worlds – a gas grill and a kamado grill in one. Though, in the spirit of honesty, you will need to buy both grills separately. So, what DO you get? With the Combo Joe, you get a gas grill that’s set up to accommodate the Classic 18″ standalone ceramic grill (or any kamado grill of the same size and shape). Like all Kamado Joe products, the Combo Joe is made from top quality materials and solidly constructed. The grill heats quickly with even heat distribution and the results, as always, are delicious. Combined with a standalone kamado grill, you get the versatility and convenience you want in your outdoor kitchen. Yes, the price is very outrageous. But before you say no to this grill, check out its features to understand why it’s out of this world. So what can this grill do? With this grill, you’re able to get enhanced heat retention – it can go extremely hot inside the grill while the outside remains a lot cooler. The lower grate enables you to do true steakhouse searing while the upper grate is used for slow roasting or smoking. The ash screen allows you to adjust the draft door (bottom vent) without worrying over charcoal ash spilling on you. The removable ash pan and ash tool makes cleanup a breeze. The grill gripper helps you handle hot cooking grates. The firebox divider makes your grill even more versatile – you can create two separate temperature zones so you can cook various types of food at once. This same feature also allows you to only use one side of your grill if you only need to cook small meals. The grill, like all other products from Kamado Joe, is airtight when completely sealed so you can smother burning coals to save for your next cookout. And the most exceptional innovation – the lid hinge system – enables you to lift the 175-pound lid with minimal effort AND it can remain in position even when it’s only at a 10-degree angle. What this means is that you don’t have to worry about the lid falling and cutting your arm off even if it’s left at an angle lower than 70 degrees. There’s no question that the price can be off-putting to many grillers out there despite the fact that there are so many things to love about this grill. But if you’re someone who takes BBQ seriously, then this just might be the perfect choice for you.